Decision at Doona by Anne McCaffrey (1926-2011) is one of the classics of science fiction, and one of the most encouraging examples of the basic plot of humans and Furry aliens learning to live and work together in harmony. 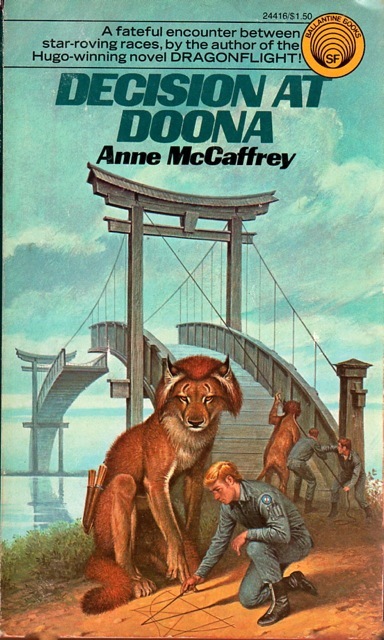 Published in 1969, it was one of the favorite novels of the proto-Furry fans within s-f fandom in the 1970s and the earliest Furry fans in the 1980s. In the far future, two civilizations are unaware of each other; humanity and the felinoid Hrrubans. Both face catastrophic overpopulation which is leading to exhaustion of natural resources and food, a sharply increasing suicide rate, an increase in public apathy resulting in a dramatic decrease in training for technical or administrative positions, and so on. Government officials fear a complete collapse of civilization in just a few more generations.